Our series, “Are They Smarter Than A Fifth Grader? The Audio Edition,” attempts to provide the tools to describe our everyday technical concepts in simple terms. 1) basic mixer, (2) DSP with matrix mixer, (3) zone processor, (4) production mixer. As I was trying to say before I interrupted myself…even when we use a term as basic to us as “mixer,” the potential for different meanings may cause confusion for end users. In addition, we occasionally see the wrong type of mixer specified for a project. 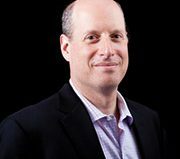 This indicates that there is a need to educate some integrators about the different types that are available, along with their strengths and limitations within a particular type of environment. Any device that combines one or more sources into a single audio signal can be called a mixer. Using this as a jumping off point, let’s define something we’ll call a “basic mixer.” A basic mixer will have a fairly limited number of inputs (usually fewer than eight) and a limited number of outputs (perhaps only one or two). The controls are oftentimes limited to individual input level for each source and overall output level. The input level is used to adjust the relative blend between sources. Perhaps the sources are two microphones. Speaking into the first microphone is someone who talks very loudly. In the second microphone, we have someone who speaks very softly. If we want them to sound similar in level, we would need to turn down the input level from the microphone of the loud talker and turn up the input level coming from the soft talker’s microphone. If the overall level is too high or low, then the output level is adjusted accordingly. Perhaps a CD player is connected to a pair of the inputs. If the intention is to use the CD as background music, the input level from the CD player can be turned down and the input level from microphones turned up to get the proper blend. Again, the output level is used to adjust for the overall level in the room. These basic mixers are relatively easy for end users to operate using the level controls on the front panel. Some offer the ability to attach a wallmounted remote “volume” control to adjust the output level. This makes it even easier for the end user because he does not have to know the difference in function between input level and output level controls. However, limiting access to just output level may restrict the end user from making adjustments to compensate between various source levels; for example, our talkers with different speaking volumes. Basic mixers are easy to integrate, but they are not very flexible. A basic mixer may also be called a “line mixer” if it only provides for line level sources and does not have any microphone preamps. Beyond level control, some basic mixers may include limited tone control on the output. Basic mixers can be anywhere from a half rack space to a few rack spaces in size, and usually have the controls accessible on the front panel. Due to their simplicity and limited functionality, basic mixers are often found in places that do not require a lot of flexibility, such as a restaurant that may have occasional private events where background music and a couple of microphones for toasts may be required. A mid-sized corporate break room that only requires a couple of sources at a time could be another candidate for a basic mixer. Moving up, we have the “matrix mixer.” For those who are familiar with live sound consoles, this is a little different than the matrix mixers you may find there. Matrix mixers in general allow us to take multiple inputs and route them to our choice of multiple outputs as needed, and to adjust for individual input and output levels, as needed. Many matrix mixers provide for connecting USB audio from a computer, Bluetooth connectivity for wireless playback and telephone connections. This is in addition to the standard inputs for microphones and audio connections. Perhaps we have a conference room with a dozen microphones around the table. The conference room is small enough that everyone within the room can hear each other without the microphones. The microphones are used for a videoconferencing system and so participants can hear audio in an overflow conference room when required. In this case, we need one input for each of the 12 microphones and an input (or two) for the videoconferencing system. We need three outputs, each containing a different mix from the sources. One output going to the videoconferencing system would just have the microphones surrounding the table. Another output would go the amplifier that feeds the speakers in the room. This output contains the only signal coming from the videoconferencing system. A third output goes to the overflow room and would contain signals from both the table microphones and the videoconferencing system. In some cases, the front panel on the matrix mixer may look even simpler than the basic mixer. Yet, the features available to the integrator inside the software are often very extensive. These features may include all sorts of tone controls (called filters or EQ), automatic level controls (in the form of compressors, limiters, gates, etc. ), setting a priority mic to turn off other mics when the meeting’s leader is talking, and many others. The technology that allows for the diverse and flexible set of features within a matrix mixer is digital signal processing, commonly known as DSP. The features available using DSP within these mixers is often so flexible that the device itself is commonly just referred to as DSP instead of matrix mixer. From this point forward, we will use the term DSP to refer to the unit that includes the matrix mixer plus other features. In our example, the end user requires the ability to turn off output to the overflow room during private meetings and when the overflow room is not in use. Yet, the signal may still have to go to the videoconferencing unit. The controls to make this happen within the unit would probably be too overwhelming for a typical end user. So these mixers are commonly hardware based with limited control available from the front panel. Although most of the setup is done by the integrator using software from the manufacturer, a separate control system is then designed to give the end user access to the functions required, based on how the system is being used. This basic control may include muting all microphones, sending audio to the overflow room or starting a videoconference. Now, what happens if you have multiple microphones in a single room and no one to control their individual levels? Our conference room with a dozen different microphones is bound to have people who talk at different levels. Plus, even if only one person is talking, all the other microphones are picking up some background noise. If you add the signal from all the microphones that are just picking up background noise to the signal that includes the person talking, it may get distracting or hard to hear. End users in many situations would be lost if asked to properly adjust all the different levels and settings associated with a typical system that requires a matrix mixer or DSP. 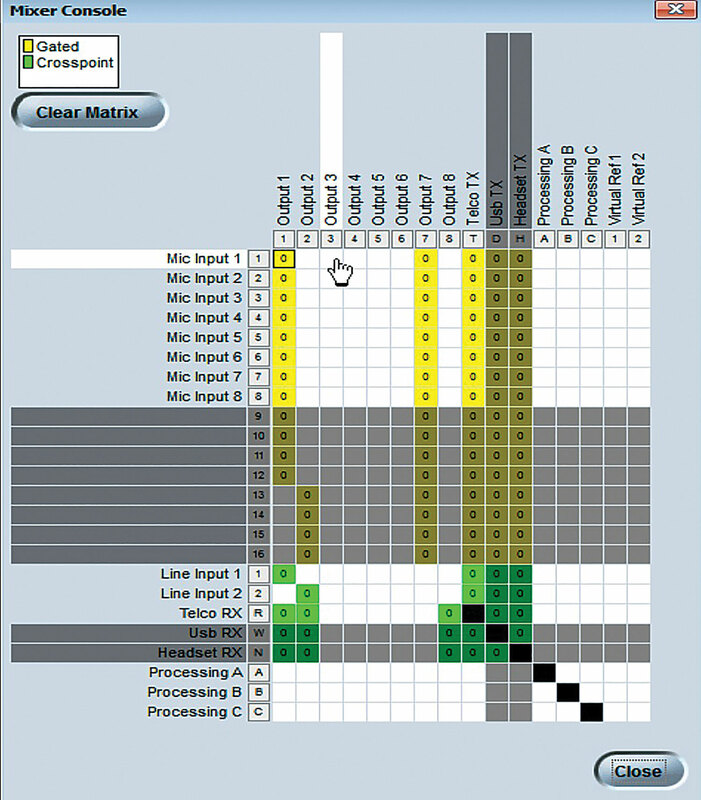 Software matrix mixer routing within DSP. This brings us to one of the most important functions of this DSP: the automatic mixer, or auto mixer. The auto mixer within the DSP takes the levels from microphones with soft background sounds and turns them down so they are not part of the main signal. The main talker’s microphone is also turned to a reasonable level as defined by the integrator during the initial system setup. If multiple people are talking, the auto mixer can turn down the output level enough to keep the overall level from getting too loud. Auto mixers can be their own category of mixer. There are a few models of standalone auto mixers on the market, and they are occasionally found in live sound mixers. Yet, it is important to mention them as part of the DSP/matrix mixer because this is the most common application for auto mixing, and it is an essential function of DSP matrix mixers in most installed environments. Because routing within a DSP’s matrix mixers provides for any input to any output, they are commonly installed in flexible-use spaces that may have to combine or divide rooms. This is common in large corporate spaces that may have to subdivide a room or change room layouts. Perhaps they have multiple conference rooms that are separated by movable walls. They occasionally open the walls and move the tables to create a larger training space. In these situations, each of the smaller rooms (or “zones”) will require an output providing audio-only from the mics or other sources within that zone. When the room is combined into a single larger space, the outputs for all the zones may have the same mix. The end-user controls for this system would have to recall presets that route sources accordingly in each of these situations. To review, DSP (when referring to a matrix mixer with auto mixer) allows us to take multiple inputs and create independent mixes to multiple outputs as needed. Initial levels and routing are set by the integrator with levels further adjusted automatically, depending on the material. These units are usually very flexible, which requires a skilled integrator to configure. Controls for the end user are usually in the form of a touchscreen, keypad or similar device that provides just enough control to meet end-user requirements. Ease of use for the end user will depend on how this control system is designed. In some systems, a full matrix mixer with extensive DSP may be overkill. Perhaps a hotel has a large conference space that is sometimes divided into multiple smaller rooms. For larger events, sometimes a live band or DJ comes in with their own equipment, or they rent a larger system from the hotel. When the live band or DJ is not present, users just have to be able to plug in a microphone or one other source and have it heard from the ceiling speakers within the room. They need to be able to select what source is playing in each zone when combined or divided. There is no mixing needed: just source selection and volume control in each zone. In these cases, a “zone processor” may be the best option. Zone processors have multiple inputs (sources) and multiple outputs (zones). Unlike a matrix mixer, zone processors typically don’t actually mix sources. They allow users to select the single source they are listening to in a specific space. This is done in the background by routing a source to a specific output. Oftentimes, the selection is made on a wallmounted keypad where the end user presses the button for the source and has a single volume control for the overall level. Some units allow for control from the front panel and may not require an external source selector with volume control. If the Zone Processor does allow for mixing, it is usually very limited, perhaps to a single microphone for paging or talking over the other sources. Additional signal processing is often available in the form of tone controls (“filters” and “EQ”) and automatic level controls, but is rarely as extensive as the DSP mentioned with the matrix mixer. This makes setup easier for the integrator and results in a lower cost for the device, but the tradeoff is reduced flexibility. Some zone processors include automatic feedback suppression that is very helpful for when someone walks under a ceiling speaker carrying a microphone. The mixers you may see at a live concert or inside a large recording studio with all the buttons and knobs on top are examples of “production audio mixers.” Although rarely referred to by these specific words, production audio mixer is a useful description to distinguish this general classification of mixer from those previously mentioned. 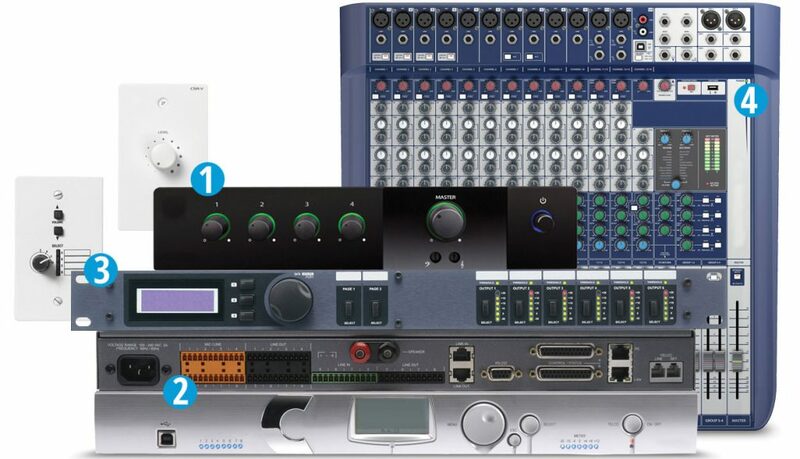 A mixer used for live sound production has the capability of mixing multiple inputs to multiple outputs. Perhaps one mix is for what the audience hears (“front of house”), and multiple other mixes could be for musicians to hear themselves (“monitors”). Most of these mixers provide at least basic EQ and filters; others provide extensive signal processing, and some even provide auto mixers. Unlike the DSP-type matrix mixers covered earlier, the layout of a production mixer has all the controls accessible right on the unit. This is designed to allow for fast changes of an extensive number of settings on the fly. Although beneficial in demanding performance environments, it can be too overwhelming for the untrained end user. Production mixers typically require more physical space than a DSP with similar inputs and outputs. Although many of the digital versions of these mixers do allow for recalling presets (or “scenes”) and can even be controlled remotely from a tablet, the user interface on the remote is also potentially too demanding for untrained end users. As a quick recap, there are a number of different types of mixers. The basic concept of mixing is relatively similar across all these devices, but differences in inputs and outputs, routing, user interfaces, automatic mixing, AEC and DSP all play into the suitability of a particular mixer type for a specific application. The next time a customer asks why you recommend one type of mixer over another and why it may cost more, consider reaching into this bag of tricks to help with the explanation.